This is one of my most important lessons because not only is the content very precise but it refines student's ability to consider significance as an historical concept. 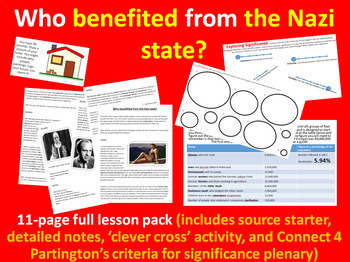 The lesson begins with a starter activity which invites students to consider the basest aspects of Nazism and then leads into a detailed set of notes. The class then complete a 'clever cross' activity where they measure who gained the most and in which they complete a numerical exercise. The lesson concludes with a powerful plenary in which students are introduced to Anthony Partington's criteria for measuring historical significance and this is linked directly back to the Key Question. I hope your students gain as much from this skills and content based lesson as mine do.